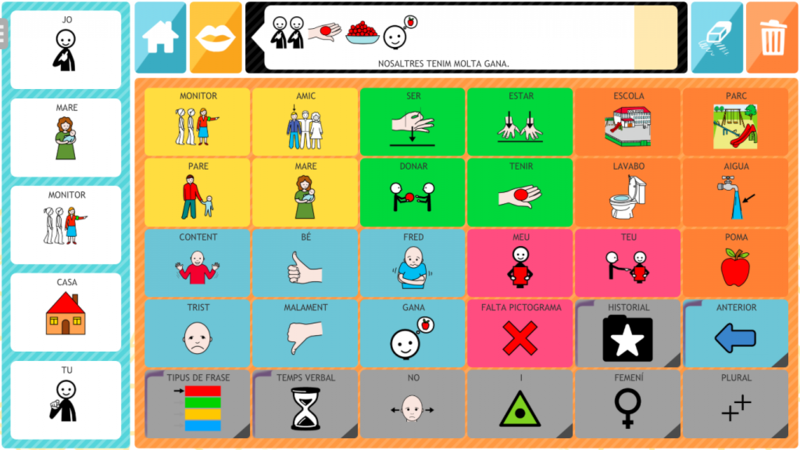 Jocomunico is a free Augmentative and Alternative Communication (AAC) app aimed at persons with severe speech impairments who use pictogram-based communication methods. 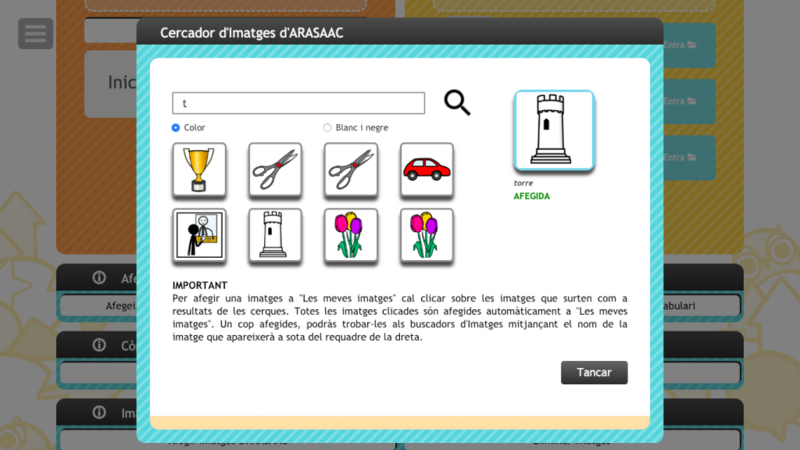 The application automatically expands telegraphic language resulting from pictograms into natural language sentences in Catalan and Spanish. For instance, it transforms a group of pictograms such as «I go school tomorrow» into natural-sounding sentences: «I will go to school tomorrow». Jocomunico is a pioneer in this field, allowing great flexibility in sentence building and giving users the chance to add customized vocabulary. Jocomunico also features a pictogram prediction system, which not only learns from the user’s behaviour but also takes into account semantic information of pictograms along with some of the conversation context. In the history you will find recently generated sentences. History feature allows you to create folders to store these sentences along with other sentences input by keyboard. This feature can help reduce communication time and it also offers the chance to prepare conversations in advance. Furthermore, the application can be supported by several Internet-enabled devices such as smartphones, tablets and computers running any OS. An offline computer version -Windows XP or higher and for Mac OS X 10.6 or higher- is also available. 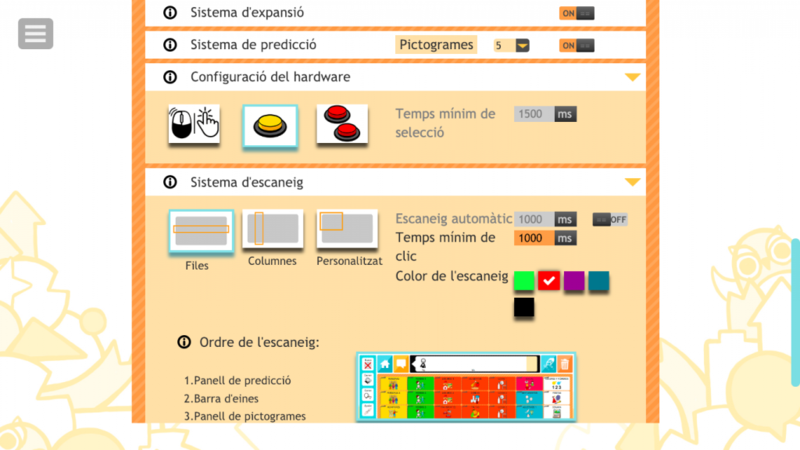 Jocomunico provides user with different accessibility options: touch-screen interface access on tablets by using one or two external switches or a regular mouse; highly configurable screen-scanning options; click or time-selection configurable options; completely customizable panels; online service of voice synthesiser or access to local voices in the offline version (SAPI and Microsoft Speech Platform for Windows or VoiceOver voices for Mac OS X), etc. Jocomunico can be a useful tool for speech therapists in order to work on different language development issues, such as verb tenses, sentence modalities (commands, questions, wishes, negative sentences, etc.) building well-ordered sentences, among other uses. It can also help encourage pictogram-based CAA advanced users making the leap into reading and writing. This application has been developed in the context of a PhD research project. The project has been funded by Fundacion Adecco in partnership with Telefonica, under the Talentum Start-ups programme by Telefonica. Jocomunico by Joan Pahisa is licensed under a Creative Commons Attribution-NonCommercial 4.0 International License. Jocomunico is a free open source application under a Creative Commons license that can be modified and extended by independent developers. It can also be adapted to the specific needs of a particular user or group of users. The expansion system that expands telegraphic language into natural language, as a part of the application, is therefore ready to be extended. 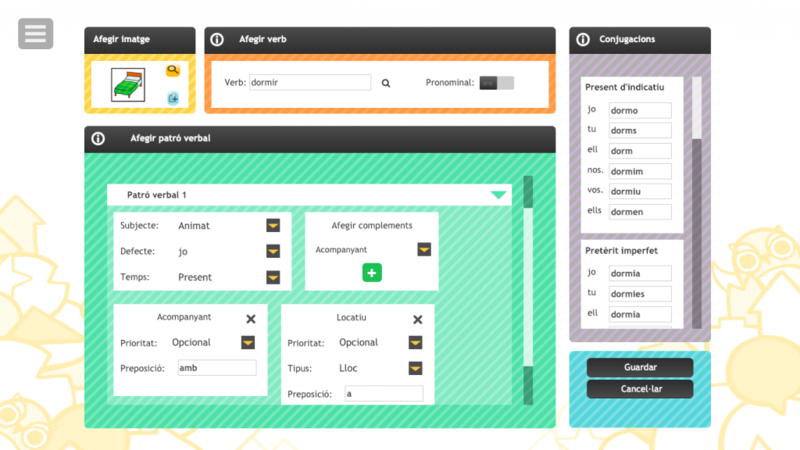 The app/source code consists of a parser, which is able to support different languages regardless of their structure, and a language-dependent generator, currently in Catalan and Spanish. To add a new language, a new generator can be created from the existing ones. In addition, the syntactic and semantic information of the new vocabulary needs to be entered as well. Developers that wish to expand the application or that want to work or reuse part of it (i.e. the system that expands telegraphic language into natural language) can find the code of Jocomunico 2.1 at our GitHub repository. For more information, visit www.jocomunico.com.